Today I am showcasing one of the super cute new releases at Whimsie Doodles. This wee fellow is called Heart Strings Bear and well...he is so adorable. I coloured him with my copics and fuzzy cut him out. I created the background using embossing paste - I love this stuff!! The frame I cut out from 3x4 Journaling cards from a Project Life pack I bought on sale. I love the colours in this pack and am sure I will be using them again and again....to make cards!! I coloured the die cut heart with copic R81 to match my image and then added some glossy accents. I also coloured the die cut sentiment using R0000. Sweet Stampin' Challenge - New. The image is brand new as are the journaling cards I used for the frame. Make sure you pop over to the Whimsie Doodles Blog to see all the other fantastic cards the girls have created with new images. Thanks for looking, hopefully see you again soon. 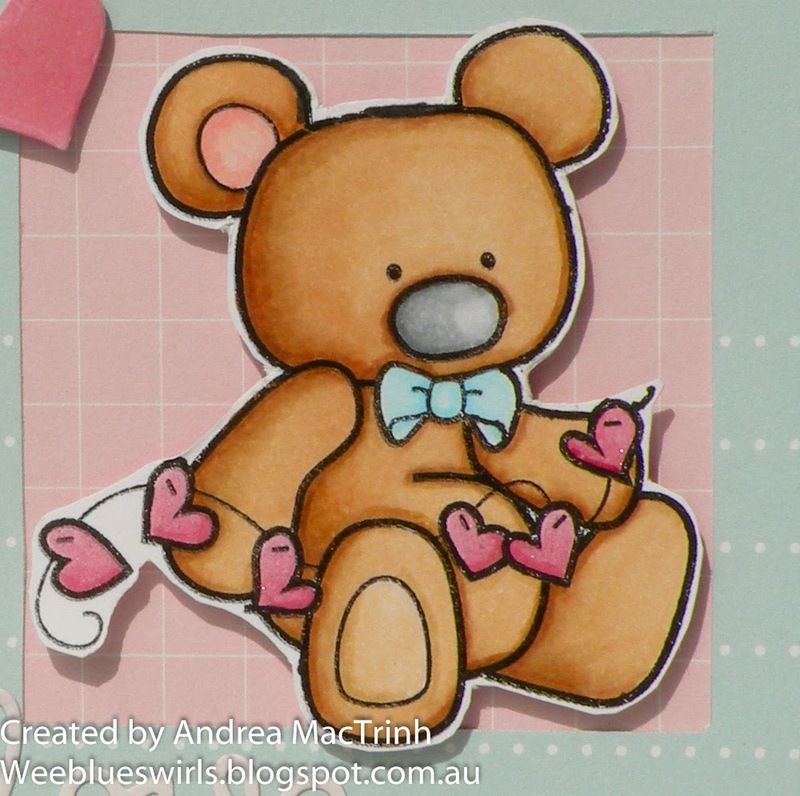 I really wavy to pick up this little teddy and give him a big hug as you've brought him to life so well with your fabulous colouring Andrea! Super cute card! Love your beautiful colouring. What a charming car. Love it!Thank you for joining us at ABC CHALLENGE! Good luck and please join us again for our next challenge! Super sweet card! Love the soft colors! Thank you for joining us this week at Cupcake Inspirations! Oh this is just the sweetest card! I love it!! So glad you shared at Cupcake Inspirations! Hope you will join us again for our new challenge tomorrow! Happy Saturday!